Music lovers are able to listen to their favorite streaming music apps on the go while using less mobile data. Opera Max, a data-management and data-saving app for Android phones, is the first app in world to optimize streaming-video and -music apps, reducing data usage. 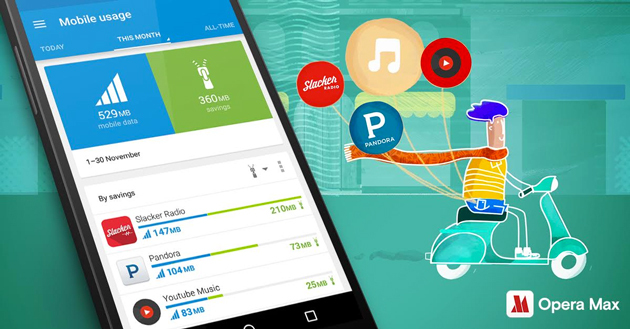 One month after introducing video savings for YouTube and Netflix apps, Opera Max, in its latest version, now offers data saving on music apps including YouTube Music, Pandora, Slacker Radio, Gaana and Saavn. This means users of these apps can enjoy data savings of up to 50% with Opera Max. According to the report from Next Big Sound, 1 trillion audio streaming plays so far in the first six months in 2015. That averages out to 140 streams for every single human on the planet. Usage of streaming-music apps has increased substantially, with the growing adoption of smartphones, especially in emerging markets. However, listening to streaming music or online radio for 9 hours would take 1 GB of data. It could easily burn through users’ data plans if they were streaming through mobile networks. Opera Max uses streaming audio optimization powered by Rocket Optimizer, which manages streaming audio traffic in the same way that it optimizes video traffic. It supports both MP3 and MP4 stream formats, and it can also convert streams to the more efficient AAC+ codec, which is able to deliver high audio quality over a low bitrate connection to any compatible device. Opera Max gives users data savings of up to 50% across most apps and browsers, including video apps, such as YouTube, Netflix, and IMDB, among others on mobile networks as well as on Wi-Fi. This app also helps users monitor and keep count of how much mobile internet or Wi- Fi they have used, on a monthly or daily basis, giving them better control over their data plans. Opera Max is available for users with phones running Android 4.0 and above. It is free to download from Google Play.